When you have a baby, nothing seems to accumulate as quickly in your home as toys do. This is especially true when you have multiple children. With our daughter, everything was pink: cars, tea sets, dolls, hairbrushes. We managed to keep things contained. Our house decor stood firm against the attempted pinkification. Then we had twin boys, and it became a two-pronged assault. Cars, trains, and fire trucks invaded. A toy castle popped up right under our nose. The tide of the toy wars had turned, advantage kids. We’ve managed to hang on (and you can too) with this arsenal of toy storage solutions. 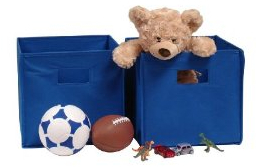 Lightweight toy storage bins are a great place to start. You can carry these around and collect toys as you go, then stash the bin under a table or in the corner of the room. These folding storage bins are great to keep in the play room, family room, or anywhere else in the house that needs some extra storage. They’re lightweight with open handles, which is handy if you’re patrolling around the house picking up toys (and you will be! ).They’re made of non-woven polypropylene and paperboard, they fold flat when not in use, and they cost about $10 a pair. Not a bad deal at all!Measurements:10.5″ by 10.5″ by 10″ tallAvailable Colors: Blue, pink green, red, orange, light blue, lavender, and even hot pink. Next up are the traditional toy storage: toy boxes and toy chests. You’ll eventually need one or more of these (we have three) as the toys accumulate. They’re great because you can fit a lot of toys in them and then close the lid, keeping everything out of sight. When we clean the living room each night, the toybox is the star of the show. Plastic toy chests are a popular choice for play rooms and nurseries. These are durable, softer to bump against, and have the capacity of regular toy chests. They’re also easy to clean (you could even hose it out if need be), which is a nice perk. Wooden toy chests offer some advantages. These tend to be large, offering plenty of space to stash toys. Wood is durable and solid; it won’t bend or slouch even when filled with toys. And let’s be honest, a nice wooden box just looks classier. We have one in our living room, sitting unobtrusively in the corner. Not that brightly colored toys and toyboxes don’t have a place in our house. That place just isn’t the living room. One challenge in shopping for a wooden toy chest is to find one that’s made of quality materials, e.g. solid wood rather than painted particle board. Don’t believe it’s wood just because it has a cherry or honey oak finish. You can paint any color finish on particle board! I had to really search, but I did find this wooden toybox from KidKraft that’s well-reviewed and mostly wooden construction. Other than that, your best bet may be to make your own or get one used. 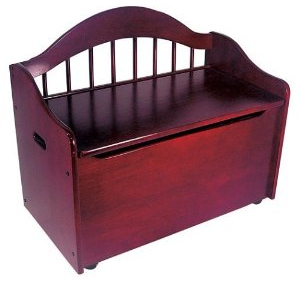 The KidKraft limited edition wooden toybox offers three things: style, storage, and extra seating. 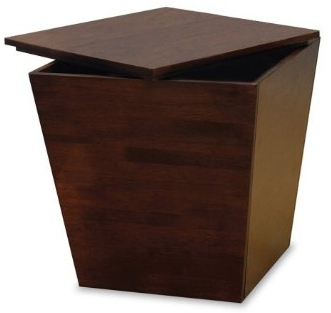 With its curved arch back and sold construction, you can sit on the box when the lid is closed. There’s a generous storage compartment beneath, and a safety hinge to ensure that the lid won’t slam shut on your little one’s fingers. Note that the black, white, cherry, and honey finishes are sold by Amazon.com and include FREE shipping, which you’ll want for the 60 pound package that it ships in. A collapsible toybox is a nice alternative to wooden toy chests, if you won’t be using it all of the time or want something softer to keep in the play room. These are also more portable, which is good for travel or gift-giving. 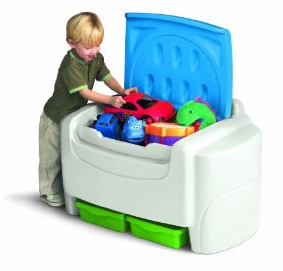 The Kangaroom collapsible toybox is a lightweight but durable nylon toy chest. With a flip over lid, convenient carrying handle and collapsible design it’s easy to fold up and move about. 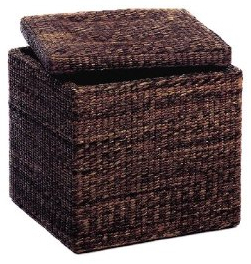 This design is camel with chocolate brown trim, a snazzy look for anywhere in the house. All around, it’s a good alternative to a wooden toybox. Have you heard the saying, “A book is a present you can open again and again.”? If that’s true, then my kids open about 200 presents a day. And they’re scattered all over the house. We love books, and we do think they’re often better than toys, but they’re equally capable of making messes. 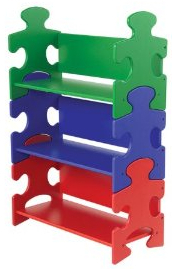 I love this colorful bookshelf from KidKraft; the sides are shaped like puzzle pieces. The red, blue, and green shelves are deep enough to accommodate puzzles, books, toys, or stuffed animals. This shelf adds a splash of color and pizzazz to a child’s room or play room, and provides nice deep shelves where you can stash their things. I love it. 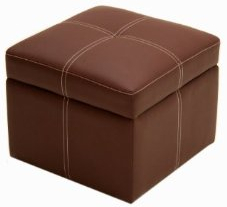 Another important weapon in our toy storage arsenal is the storage bench or ottoman. These storage spaces cleverly concealed in a nice-looking piece of furniture are the perfect place to stuff a few errant toys or books when company is coming over. They match the “adult” decor of a living room or family room, they’re durable, and they usually give you a fair amount of storage space. 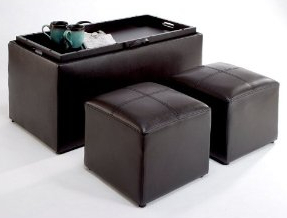 Convenience Concepts makes a storage bench with two matching ottomans that fit nicely inside of it. 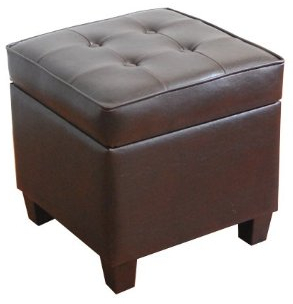 All three are upholstered in expresso faux leather with box-style stitching on top. The lid of the bench flips over to reveal a tray with handles for doing puzzles, storing drinks, etc. There are some fun, creative options for hanging toy storage out there. These are inexpensive and they get the toys off of the floor, two big advantages in my book. 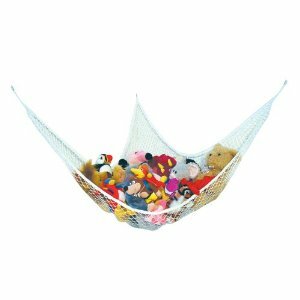 Prince Lionheart makes some outstanding baby products (the Bebepod baby seat comes to mind) and the jumbo toy hammock certainly qualifies as one. This hanging storage net has three hooks and is easy to install; you’ll probably want to put it in the corner of the room.The material is soft and stretchy, expanding up to 6 feet wide. What a fun way to keep nursery uncluttered and teach your kids to pick up after themselves! Another hanging storage option is the toy chain. 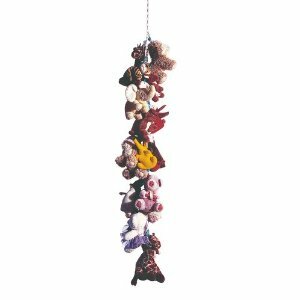 This is great on its own, or as an addition to a toy hammock like the one above.The chain is over six feet long and comes with an easy ceiling attachment; you can string it horizontally or vertically. There are 20 toy storage hooks included.The weight limit is 100 pounds, which you’d be hard-pressed to exceed. It’s a fun and attractive way to store your kids’ toys. Another option from Trend Lab is simply the hanging toy bag. This large, soft toy pouch can be hung from a wall or the side of the crib. The ties can be tied at different lengths, and the large (13 by 9.5 by 1.5 inches).The stitching is a sturdy material as well, so it should hold up. I can’t find out what the weight limit is, but with kids toys and animals, you’re more likely to pull a hook out of the wall than have this pouch break.Color options: Spirograph pink (pictured), sage green, Noah’s Ark, and 2 other patterns. 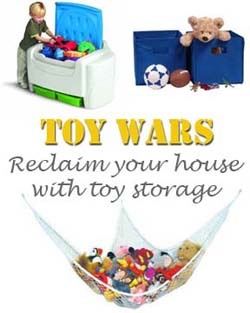 Hopefully some of these storage options will help you turn the tide in the toy wars of your home. Good luck!